Our sub­si­dia­ry UAB Klasmann-Deilmann Bio­en­er­gy has joi­ned the increa­sing num­ber of busi­nes­ses actively com­mit­ted to sustainab­le use of forest and wood pro­duc­ts. Fol­lo­wing a suc­cess­ful audit this spring, our Lit­hua­ni­an sales com­pa­ny, an active play­er in the sustainab­le-resour­ces sec­tor, is now cer­ti­fied to FSC (Forest Ste­wardship Coun­cil) stan­dards. The audit was car­ri­ed out by an inter­na­tio­nal cer­ti­fi­ca­ti­on body, a pro­cess resul­ting in the award of the FSC cer­ti­fi­ca­te. This attests that UAB Klasmann-Deilmann Bio­en­er­gy pro­du­ces its wood­chips using raw mate­ri­als from sustainab­ly mana­ged wood­lands. Moreo­ver, the ent­i­re value chain is incor­po­ra­ted, from the forest to the con­su­mer: all pro­ces­sing and trans­port ope­ra­ti­ons must com­ply with the rigo­rous stan­dards of the Forest Ste­wardship Coun­cil. The­re were many good rea­sons to obtain FSC cer­ti­fi­ca­ti­on. 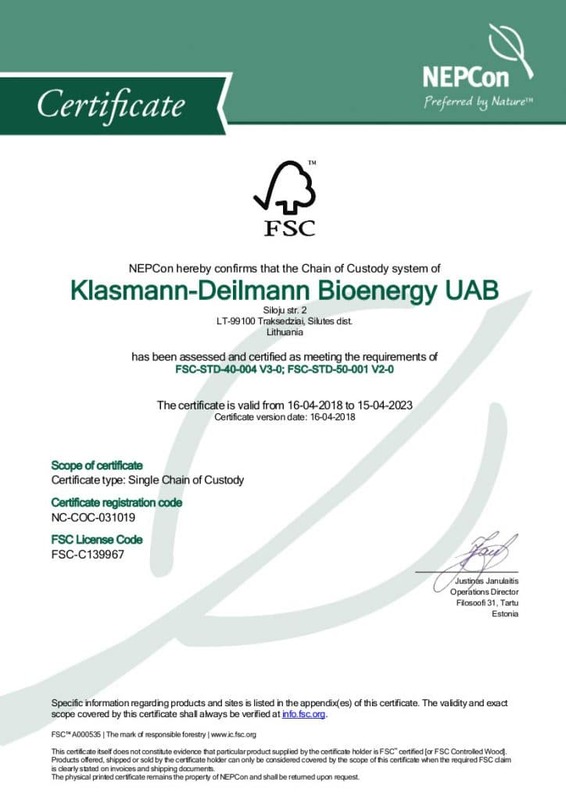 Klasmann-Deilmann atta­ches gre­at impor­t­an­ce to sustai­na­bi­li­ty, and so the degree to which Klasmann-Deilmann Bio­en­er­gy iden­ti­fies with the FSC is high. Demand for cer­ti­fied tim­ber is also increa­sing among custo­mers. And the clin­ching argu­ment in the decisi­on to under­go FSC cer­ti­fi­ca­ti­on was the fact that this cer­ti­fi­ca­ti­on sys­tem is glo­bal­ly reco­gnis­ed.